Power distribution systems are used in every residential, commercial buildings and industrial fascilities to safely control the distribution of electrical power throughout the facility. Most of us are familiar with the power distribution system found in the average home. Power, purchased from a utility company, enters the house through a metering device. The power is then distributed from a load center to various branch circuits for lighting, appliances, and electrical outlets. Power distribution systems used in multi-family, commercial, and industrial facilities are more complex. A power distribution system consists of metering devices to measure power consumption, main and branch disconnects, protective devices, switching devices to start and stop power flow, conductors, and transformers. Power may be distributed through various switchboards, transformers, and panelboards. Good distribution systems don’t just happen. Careful engineering is required so that the distribution system safely and efficiently supplies adequate electric service to existing loads and has expansion capacity for possible future loads. 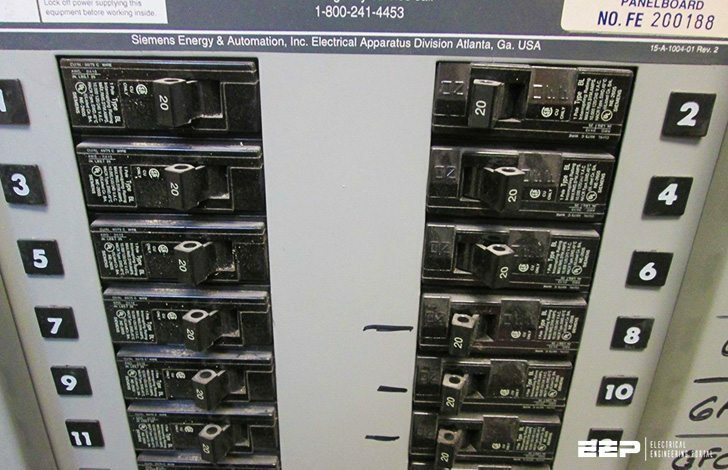 The National Electrical Code® (NEC®) defines a panelboard as a single panel or group of panel units designed for assembly in the form of a single panel, including buses and automatic overcurrent devices, and equipped with or without switches for the control of light, heat, or power circuits; designed to be placed in a cabinet or cutout box placed in or against a wall, partition, or other support; and accessible only from the front (Article 1 00-Definitions). Prior to the publication of the National Electrical Code®, the distinction between these two panelboard types was described in Articles 408.34 and 408.35. These articles have been removed from the 2008 code. However, it will take time for the industry to adapt to this change. Therefore, Articles 408.34 and 408.35 of the 2005 National Electrical Code® still warrant discussion.